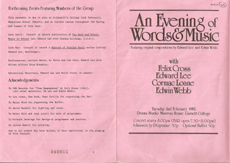 On Tuesday February 2nd 1982 Sounds Like performed a concert of words and music for the staff and students of Garnett College of Education, Roehampton, in South West London. The performance took place in the Drama Studio, an apt location, since this was believed to be the room in which the famous 19th Century poet, Gerard Manley Hopkins, taught, when the building was a Jesuit seminary. The concert was caught on tape by the AVA technicians of the College, led by David Haskell. Sadly, at times the recording quality is not all that one might wish - the diversity of the items, and the dynamic range of the group would really have required a more complex setup and team of sound engineers to do it full justice. Nevertheless these recordings are good enough to give a strong impression of the lively performance of poems which hover constantly between comedy and tragedy. 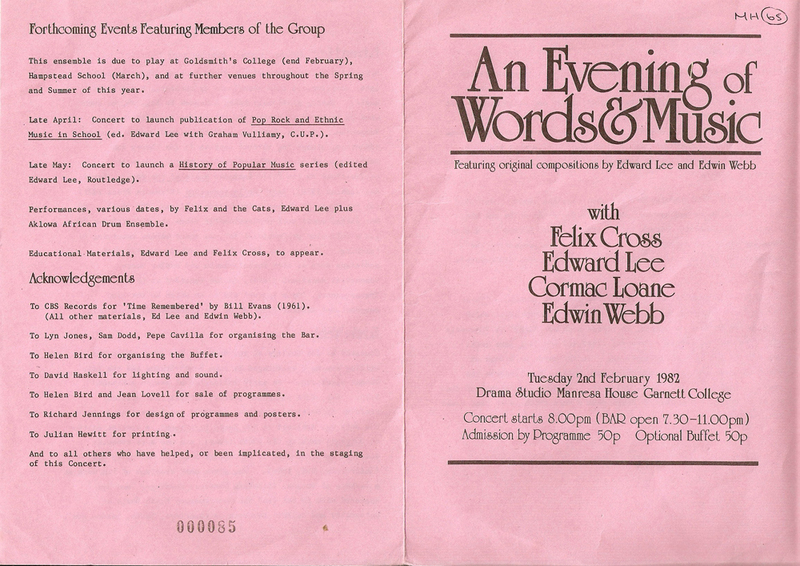 When Edward Lee and Edwin Webb first began to work together in the mid-sixties, it was in concerts of ‘Poetry and Jazz' which, on occasion, featured Dusty Hughes, Douglas Oliver and Clive James. 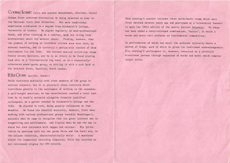 At that time they were not entirely happy about the blend they were creating: the European formality of the poems and the urbane rhythms of 'fifties-style American jazz did not always work well together. The music, in context with the words, was all too often irrelevant or naively programmatic. After several years the two writers came together again. Both had developed. There was now aninterplay between the words and the music. 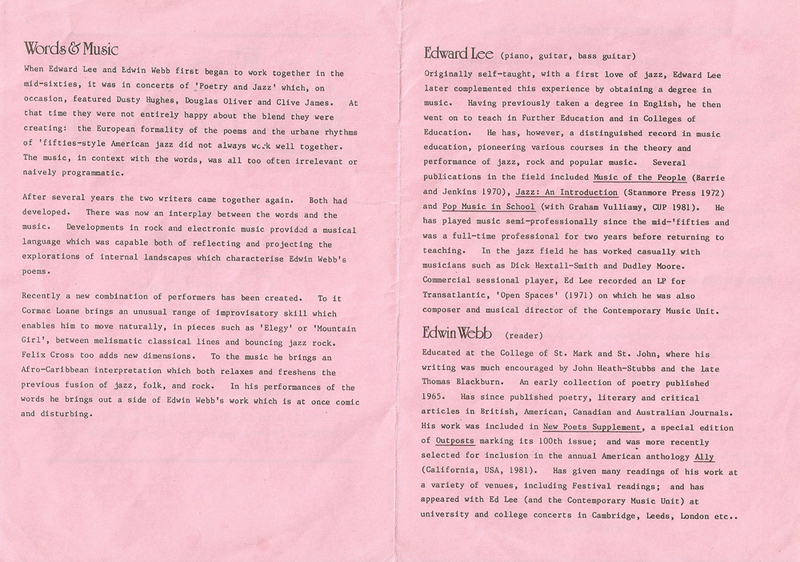 Developments in rock and electronic music provided a musical language which was capable both of reflecting and projecting the explorations of internal landscapes which characterise Edwin Webb's poems. Recently a new combination of performers has been created. To it Cormac Loane brings an unusual range of improvisatory skill which enables him to move naturally, in pieces such as 'Elegy' or 'Mountain Girl', between melismatic classical lines and bouncing jazz rock. Felix Cross too adds new dimensions. To the music he brings an Afro-Caribbean interpretation which both relaxes and freshens the previous fusion of jazz, folk, and rock. In his performances of the words he brings out a side of Edwin Webb's work which is at once comic and disturbing. This evening's concert includes three words/music items which were first devised several years ago and performed at a Celebratory Concert to mark the lOOth edition of the poetry journal Outposts. To these has been added a newly-arranged combination, 'Osiris', in which a words and music unit prefaces an instrumental composition. In performances of words and music the audience typically hears a series of items, each of which is given its individual acknowledgement. This evening's performance is, however, conceived as a carefully structured journey through sequences of words and music which compose larger units. Cormac first achieved distinction by being selected to play in the National Youth Jazz Orchestra. His more traditional experience culminated in a degree from Goldsmith's College, University of London. He played regularly in semi-professional bands, and after training as a teacher, made his living from professional music for several years. Finding, however, that the glamour of working on Caribbean cruises soon wore thin, he entered teaching, and is currently a peripatetic teacher of wind instruments for the ILEA. His current musical activities range freely across barriers, and he is as likely to be found playing lead alto in a 'forties-style big band, as in a classically ­orientated avant-garde group, or sitting in with a rock band at the Southern Stars, Deptford, South London. Since then Cormac has had a distinguished career, both as a performer – he played with Sting among many others – and as an educator, currently at the Birmingham Conservatory. Felix contrasts musically with other members of the group in various respects, but it is precisely these contrasts which contribute greatly to the excitement of working in the ensemble. A self-taught musician, he has nevertheless reached a level such that he is readily accepted alongside formally qualified colleagues, as a guitar teacher by Goldsmith's College and the ILEA. He started in rock,. being greatly influenced by Jimi Hendri~. He found his identity musically, however, first when working with various .professional groups (notably Deadringer); secondly when he came to recognise that his great interest was in songwriting and performance; and finally when he saw the. way to blend his rock interests with reggae and calypso. His lyrics (which he performs with his own group Felix and the Cats) are, in the calypso tradition, characteristically witty. A sessional player for commercial recording companies, Felix has recorded as yet unreleased singles for GTO records. Since then he has had an outstanding career, as one of the leading pioneers of theatre by Black artists. His career began with Blues for Railton, and then the ground-breaking Mass Carib. He has acted, written music, written scripts of musicals, directed theatre pieces, and managed companies. He is currently the Director of Nitro, .the Black Theatre company. After leaving Garnett College, he continued a distinguished career at the University of Greenwich. Recently he has renewed contact with Sounds Like, and various projects are in view. Edward Lee’s details are given fully elsewhere on this site. This sets a reflective mood for Edwin’s first poem, The Dark Horses, a meditation on the effect and value of words. A more sombre mood follows, as Cormac moves to the clarinet. You may recognise this theme as one which occurs as a guitar piece on the album Jeff’s Sunny Day. (You can hear an extract by going to Downloads, and you can buy the album by going to the Shop. The notation and tablature can be found in Gulf Stream, also available from the Shop ). Cormac then creates an impassioned solo. 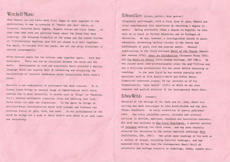 Felix changes role to present Edwin’s poem, in which the concepts of the power of music, and of the woman are mingled. Felix works very close to the microphone, which has meant some problems of technical quality. It has not been possible to remove the sibilants satisfactorily. Edwin gives a thoughtful comment on the nature of relationship of music and poetry. This leads into Bolero, (notation available in the album Gulf Stream) with the theme played by Felix, followed by Cormac (soprano sax). Felix takes the first solo, which bridges rock and blues. Cormac returns with another powerful solo. Edwin returns to read L’amoureuse complaisante, a powerful evocation of physical love, then Felix follows with a contrasting poem on the theme, Lovelight. Sadly, again, the quality of recording does not do full justice to the reading. This section ends with Gulf Stream, another piece which can be heard as one of the CMU at Leeds recordings. There is also a version on CMU at the Tech. Cormac returns to the flute. It is interesting to contrast his interpretation with that of those of Ed and Terry Mortimer in the Leeds versions. There is also the chance to compare Ed’s use of the piano for the solo, with what he did on guitar. Edwin’s announcement cannot be bettered as an introduction to this item, the first in the concert in which words and music are linked in one piece. The musical vehicle is Osiris, which can be heard as one of the CMU at Leeds recordings. This Garnett performance was later followed by the inclusion of the piece on the album Gargoyle, to be released later this year. Musically, there is a fascinating three part improvised interplay between the lines of the flute and piano and the rhythm of Felix’s guitar, before the piece moves into the riff which energises the second half. Here Cormac moves from the pastoral flute to a highly emotional sax solo. An Edwin announcement sets out the themes of what is to follow. Time Remembered is an improvisation which uses the chord sequence of Bill Evan’s theme of the same name as a basis. 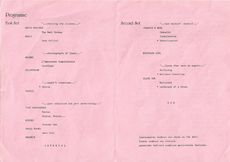 At this point the recording departs from the order given in the original programme, as Felix and Edwin perform the poem Mirror, Mirror in which a simple familiar scene is used to explore sense experience and identity. A short improvisation (Echoes) by Cormac follows in which his swirling flute interactions with its electronic reflection by using delay techniques. Edwin and Felix return with Journey Man , a twisting and turning reflection on time and identity, which shows that even serious subjects can have a humorous dimension – the audience laughs even if they would not care to say exactly why. There are technical defects in the recording. A short musical episode follows. This is an Ed composition which has had several names. It was originally Slow Blues (it uses the 12 bar blues form), was played by the early CMU, and then became the title song of a three piece suite for singer James Gordon. This was in fact performed during the Leeds concert, though the recording quality was not sufficient to permit it to be included among the ones available on this site. At the time of the creation of the present concert it was called Small Hours, but then changed to its final and current title There Was A Man after the opening line of the poem to which it is here a prelude. ( A guitar version of this piece is available in Gross Ideas, a book available from the Shop). In the concert the piece was played in full, but in those days of more restricted technology the tape ran out and only what you hear could be retrieved ! Late Call follows, read by Edwin. It is again a deep and sobering reflection on identity which nevertheless also contains flashes of humour. Felix continues with Facial, a description of a clown making up. He skilfully offsets the transformation with the mechanics of the trade and the real social identity of the circus identity. Again, the technical quality of these readings is not as high as desirable. To lift the mood for the interval the trio go into Damaris, a Latin jazz theme , dedicated to a former student of Ed’s. During his reading of the noted psychologist, Edwin noted some bizarre quotations. Their inclusion delighted the trainee teachers in the audience. This is another Edwin exploration of personality and identity. The ending, when the voice of the dummy is heard continuing after the (recorded) applause has sharply different effects on the audience. Among the uneasy silence, one voice can be clearly heard taking refuge in laughter. This piece especial significance to both Edwin and Ed, as it was the first in which they developed the more integrated and musically wide-ranging approach mentioned earlier. At the same time it was a turning point for Edwin as a reader, in which he crossed over from the standard approach to reading poetry to the more dramatic manner Ed had seen through working with actors. He came to realise that this interpretation reflected much more fully his intentions, which had been largely unconscious at the time of composition. You may recognise this theme as another one which occurs as a guitar piece on the album Jeff’s Sunny Day. (You can hear an extract by going to Downloads, and you can buy the album by going to the Shop. The notation and tablature can be found in Gulf Stream, also available from the Shop ). As Cormac says, the opening mood is pastoral, but then turns to a lilting rhythm, enlivened by some country phrases from Felix. Two pieces whose landscape is the sea, though their themes deeply probe aspects of experience. In Surfacing Ed reads the brooding words. 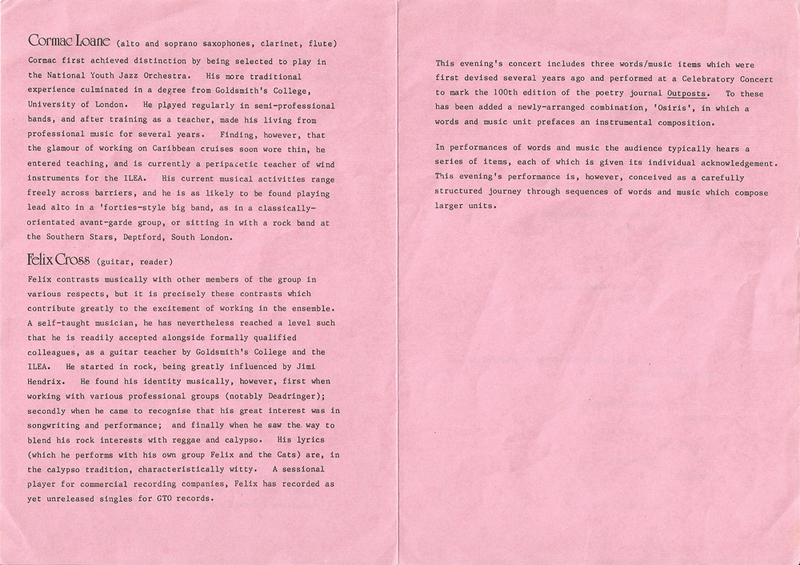 This was another landmark track in that the direction offered by Edwin and Felix enabled him to create a convincing reading and so to contribute to that side of the project. Northern Coastline is a very evocative and moving poem, whose development is brought out by Edwin in a carefully modulated reading. The whole is underpinned by a musical backcloth inspired by the sounds of movement of the sea, all created with the electric guitar. This piece is also a highlight of the forthcoming Gargoyle album. The aim of this highly unusual variant on the 12 bar blues form was to raise the energy level of the performance whilst intensifying the mood. There are sax and guitar solos. This was a feature of the early CMU repertoire, whose version can be found among the CMU at Leeds tracks. 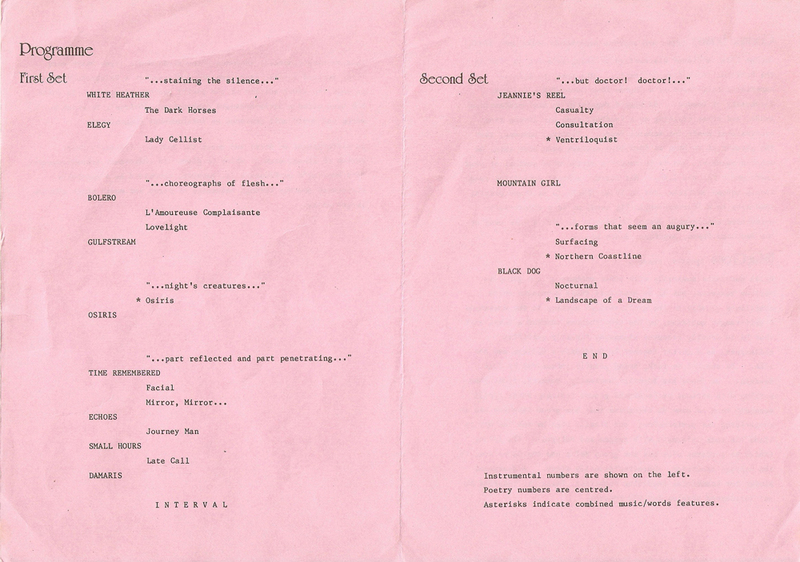 As can be seen from the original programme, two further items followed – the poem Nocturnal and Landscape of a Dream. The latter was another integrated piece, and the version by Terry Mortimer will be on the Gargoyle CD.